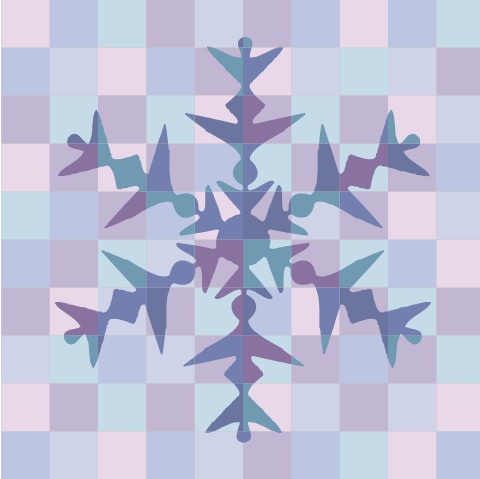 Join us for some unique, frosty art activities for children of all ages. Make colorful ice cube art, create special snowflakes with water colors and crayons and more! Bring new scarves, hats and gloves throughout December and help decorate the Mitten Tree. The Good Neighbor Center will give them to homeless families in Washington County. Generously sponsored by Friends of the Tigard Library. 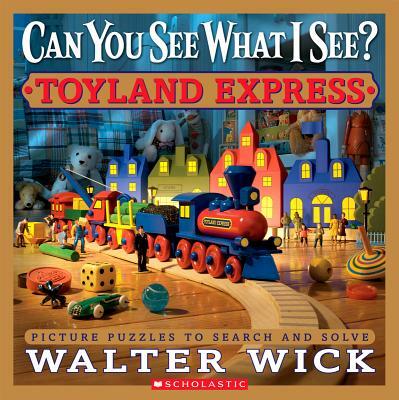 The I Spy picture books are quite popular at the library. Do you or your child ever wonder how all of the photographs in the books came to be? 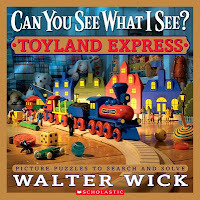 Scholastic Books goes behind the scenes into the author/photographer Walter Wick's studio to see how he created his latest book, Toyland Express. Take a look at this 3-minute video link. http://bcove.me/zz7aijps You'll be amazed!!! Our collection of 30+ magazines for children and parents, housed together to the right of the Alphabet Chair in the Juvenile Fiction area, includes titles to support the recreational, developmental, and informational needs of children 0-11 years of age and their parents/caregivers. One of our selections, American Girl, has been the most popular magazine in the whole library for the past several years! Other great titles include Discovery Kids, Babybug, and Sports Illustrated for Kids. Magazines for parents and teachers include Familyfun, Working Mother, and Book Links. Current issues are displayed in protective covers and don't circulate until the next month’s issue is received and processed. Back issues of the current and previous years circulate for three weeks, just like books. Mosey back to the corner marked "Periodicals" and check out some magazines today! 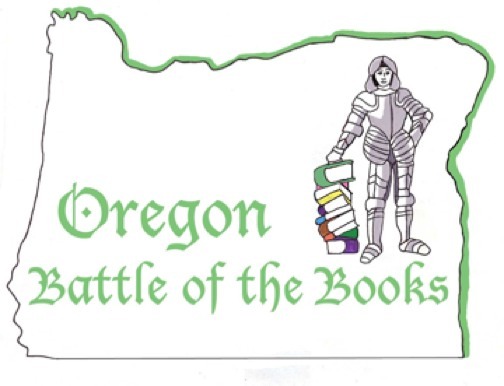 Many children this year are gearing up to participate in the Oregon Battle of the Books, also known as OBOB (pronounced as "Oh-Bob"). 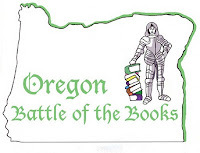 If you are unfamiliar with OBOB, this is a statewide program for reading motiation and comprehension sponsored by the Oregon Association of School Libraries in conjunction with a Library Services and Technology Act grant. The goals of the program are to encourage reading for enjoyment, broaden reading interests, and increase reading comprehension, and promote cooperative learning. There are three divisions of the program, Grades 3-5, Grades 6-8 and Grades 9-12. The library carries multiple copies of each of the books on the division lists. We do have a display in the juvenile fiction area of titles that are available. Holds can be placed on titles that are checked out to other patrons. The last day to register your school is November 30th. Each team must have a sponsor from their school library or other school staff. For more information about the program and for a list of books for each division, visit http://oboblsta.pbworks.com/. Going stir crazy after a long Thanksgiving weekend with relatives and need a little downtime before the holidays start to get even crazier? Join us this Saturday, November 26 between 1:30 and 4 in the Community Room for the Mega Craft Workshop. This is an all ages event. 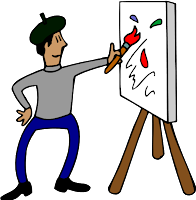 Adults and children will create holiday cards, fused glass art, Huichol yarn paintings, stained glass paper art, beadwork, bookmarks, and much, much more. Feel free to drop in any time; you don't have to be there at the very beginning. Hey, did you know that this November is the first annual Picture Book Month? Check out the official website for essays from famous authors, illustrators and educators about why picture books are so important. This very cool celebration was set up in response to the ever-rising tide of digital media and things like this New York Times article about the sliding sales of picture books in favor of chapter books for younger and younger kids. I love all kinds of books, but it makes me sad that bigger kids might be missing out on the creative, artistic, collaborative and rich experience of reading picture books and making the words and illustrations work together. Here at TPL, we always have lots of our favorite picture books up on display in the Children's Room. With school out all Thanksgiving Week, we'll be including some titles that are especially great for older kids in our regular display, from authors like Deborah Hopkinson, Patricia Polacco and Jon Scieszka. Two authors in particular, David Wiesner and Arthur Geisert, create books that are mostly wordless but have very complex stories, concepts and illustrations. Drop in and check out a pile of picture books, and be sure to ask the librarian at the Children's Desk for recommendations! As a huge fan of audiobooks, I love telling our patrons about all the wonderful titles we have at the library. I am pleased to tell you about our Juvenile Audiobook collection which consists of Fiction Books on CD, Non-Fiction Books on CD, Fiction Book Kits with CD's and Non-Fiction Book Kits with CD's. 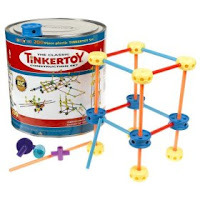 The book with CD's kits are also referred to as "kits". We no longer carry cassettes as CD's have become more popular. Kits: Our kits are mainly geared towards Preschool children through second grade. The collection is mainly comprised of picture book and early reader read-alongs. The collection also includes non-fiction titles, such as books that help children learn a foreign language. It also contains publications such as Wee Sing that includes a CD with an accompanying music booklet. A majority of all these titles have a track or separate CD with page-turn signals, making it easy for children to listen to the book on their own and to know when to turn the page without adult assistance. Children who listen to a read-along kit are receiving the same benefit as though they are listening to a parent or another adult read them a book, as they are still picking up and learning new vocabulary and other early literacy skills. Kits are a valuable resource for pre-readers because it helps them develop early literacy skills such as print awareness. 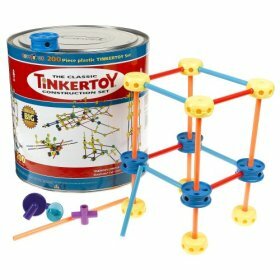 We have numerous kits that contain wonderful sound effects. 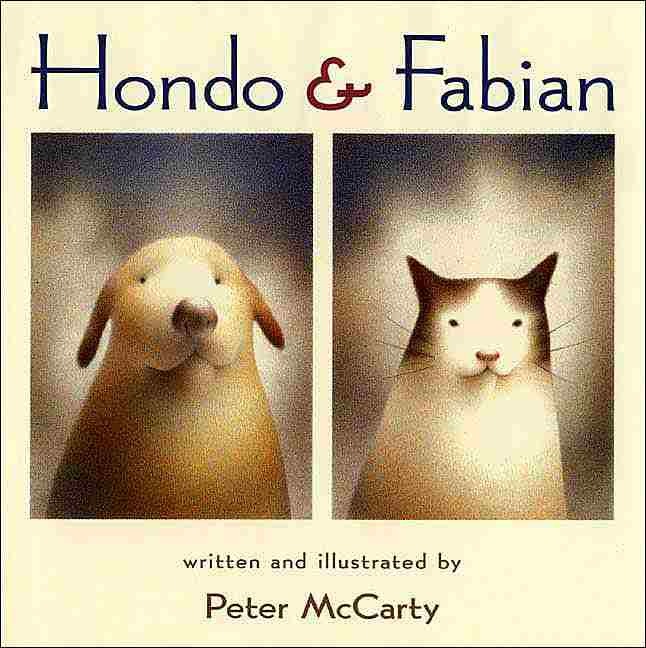 I highly recommend Hondo and Fabian, The Librarian from the Black Lagoon, and Dooby Dooby Moo. For elementary school ages, try The Composer is Dead, and Jazz. make sure there is a print edition of that title located somewhere in the overall children’s collection. This is helpful when a child would like to read along with the print book. 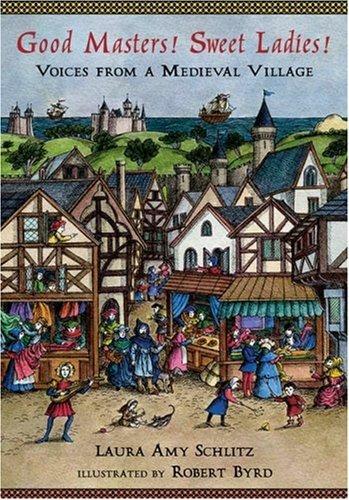 This option is especially important to children who struggle with reading as it will help aid and assist them in their reading comprehension and is an excellent way to extend the story beyond their imagination as many audiobook narrators use a wide range of expressions and characterizations to make the plot more realistic than what's just printed in the book. A good narrator can really bring a book to life. 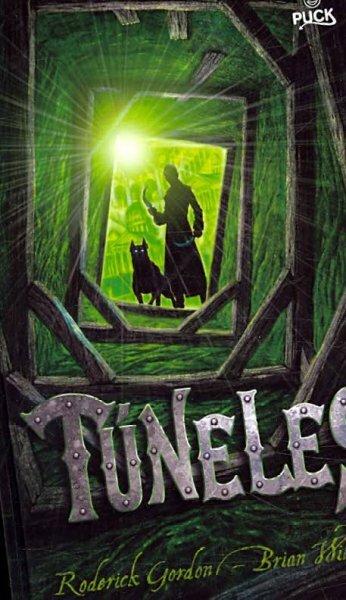 As I've listened to probably 80% of the titles in our audiobook collection and have served three years on a national audiobook award committee (going on four), I can assure you that a good match between the narrator and the text makes all the difference in the world for a phenomenal audiobook experience. To the novice listener, this may be hard to justify, so here are some great fiction examples to try: The Miraculous Journey of Edward Tulane, Alice's Adventures in Wonderland, and The Alvin Ho Collection: Books 1 & 2. 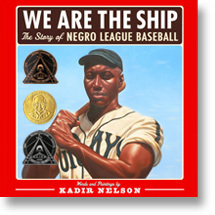 And for an exceptional non-fiction audiobook experience, try We are the Ship, Good Masters! Sweet Ladies! (with a full cast) and Marley: A Dog Like No Other. Why should children listen to audiobooks? For more detailed information on the benefits of listening to audiobooks, read this article from Reading Rockets: http://www.readingrockets.org/article/64/. I also encourage you to come to the library and check out an audiobook today! We're trying something new this year. Usually we take our winter break with the schools, but we thought we would offer story times over that break and take our break Thanksgiving week instead. So for all you teachers out there who are usually working when we offer story time, bring your kids in! And for all you parents with kids in preschool during the times we offer story time, bring 'em on in. We'll be here with bells on! 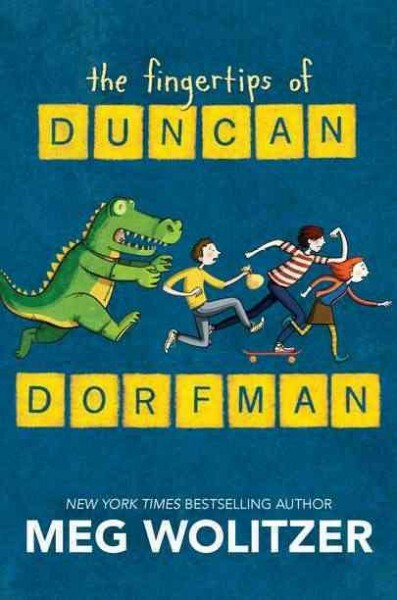 Duncan is new at school, and very soon acquires the undesirable nickname "Lunch Meat." He hates not fitting in, so he reveals that he has a special power. This catches the attention of a kid from the Scrabble club, and he finally sees his "in" with the rest of the kids. The problem is, his "in" requires using his special power to cheat at a national Scrabble tournament. But if he wins, it will all be worth it. April Blunt is the only non-jock in a family of jocks. All she wants to do is win the national Scrabble tournament to prove to the rest of her family that Scrabble is actually a sport, too. Oh, and she also wants to find this kid that she met at a motel pool 3 years ago to whom she introduced the game of Scrabble. The problem is, she doesn't know his name or where he's from or really anything about him at all. All Nate Saviano wants to do is hang out and skate, and go to public school. In fact, his rich dad even built a skate park for him in their apartment. The problem is, his rich dad has also decided he wants to home school Nate; and by home school, he really means prepare him to win the national Scrabble tournament to make up for his own loss at the tournament when he was Nate's age. Nate thinks that just maybe if he wins, his dad will let him go back to public school. Who, if any of them, will win the tournament? Will Duncan use his power to fit in with the rest of the kids? Is there a chance that April could meet the boy from oh-so-long-ago at the tournament? Will Nate ever get to go back to public school? Your kid will need to read The Fingertips of Duncan Dorfman, by Meg Wolitzer, to find out. This is a great book about difficult choices, friendship, and family. I recommend it for about 3rd or 4th grade and up. The Library maintains a circulating collection of puppets for the purpose of encouraging creative play and enhancing the home storytelling experience. Juvenile Puppets circulate for three weeks and are kept in open bins next to the Board Book collection in the Children’s Room. A child's natural approach to learning is through play and the development of imagination plays a critical role in life long problem solving and learning. When children act out stories or life events through dramatic play a variety of senses are used. Through play, your child is learning to identify and internalize a story or an event in an immediate way. Something as simple as playing with puppets helps build your child's vocabulary, self expression, relationships with others and an understanding of their world. Stop by the Children's Reference desk for some fun book suggestions to go along with your child's puppet playing experience! Our next Super Tuesday is coming up on November 15th. Tears of Joy Puppet Theater will be joining us as they present "Raven Steals the Sun". Celebrate Native American Heritage Month with this Tlingit tale from British Columbia, where Raven disguises himself as a baby to steal the sun and bring light to the world. 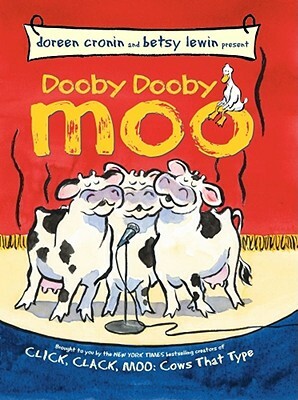 Bring the whole family to enjoy the show from 7:00 pm to 8:00 pm in the Community Room. National Gaming Day is this coming Saturday November 12th. Bring the whole family to the library to play a few rounds of our "All Ages BINGO". Anyone can partcipate and play as many rounds as they wish. There will also be prizes!!! We'll be playing in the Puett Room 1:30 pm to 2:30 pm. So come on down and spend an afaternoon with us! I also get to take care of the Juvenile Spanish collection. There are 6 sub-collections within Juvenile Spanish: Board Books, Picture Books, Early Readers, Non-Fiction, Fiction, and Graphic Novels. The Juvenile Spanish collection is housed between the Picture Books and Early Readers in the Children's Room. All of our Spanish books have orange labels on them. 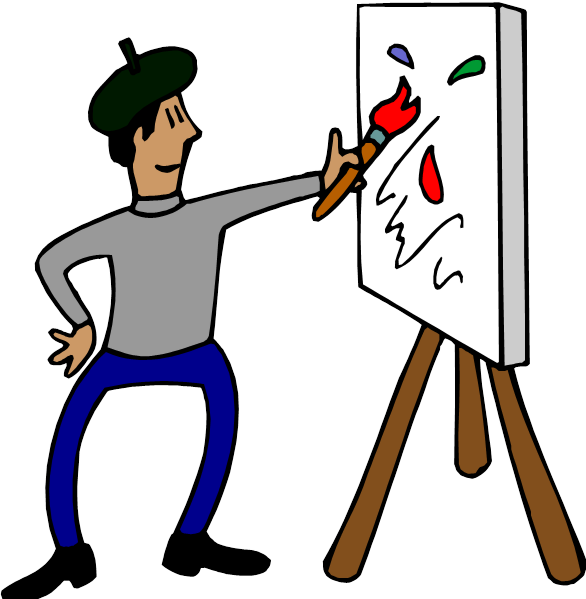 The collection is used by native Spanish speakers as well as native English speakers who want to learn Spanish. We have some books written entirely in Spanish, and some in both English and Spanish. The bilingual books are good for Spanish speakers trying to improve their English, and English speakers trying to improve their Spanish. Board Books are specifically for babies and toddlers learning how books work. 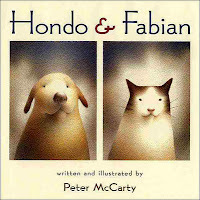 The Picture Books have a broad range of levels, anywhere from just a few words per page to several paragraphs per page. There are even a few Picture Books that include CDs along with them. 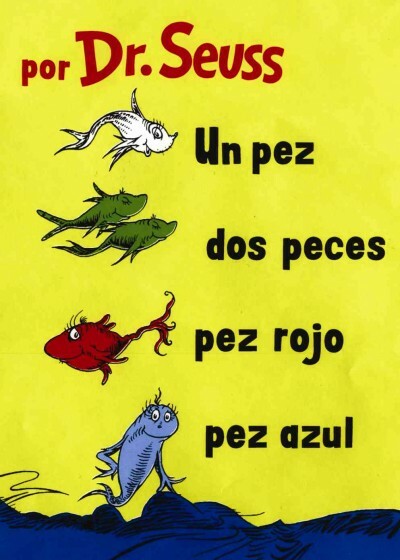 Early Readers are great for native Spanish and native English speakers to learn how to read Spanish. The Non-Fiction section has a broad range of topics that can support kids in homework and is particularly good for parents whose primary language is Spanish who want to help their kids with their homework. Non-Fiction also has some high interest topics (vehicles, animals, biographies, fairy tales, etc). Fiction is made up of chapter books anywhere between 1st grade and 5th grade reading levels. Almost all of the chapter books are written in Spanish only. We have a very small, but hopefully growing section of graphic novels, or comics, shelved with the Fiction. 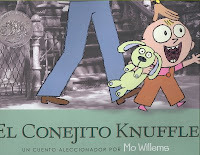 Many of the Spanish books are translations of popular books originally written in English (Harry Potter, Mo Willems, Dr. Seuss), but I also work hard on finding books that were originally written in Spanish. 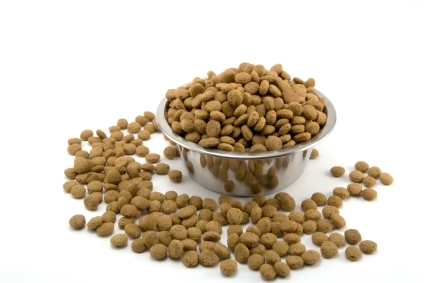 It is often hard to get Spanish translations, and they are often published way after the originals in English. Once in awhile, though, I can actually get a book in Spanish before it is published in English, like the Tunnels series, by Roderick Gordon and Brian Williams. Well, actually, I'm not going to talk about playing with food, but the thing that holds your food. 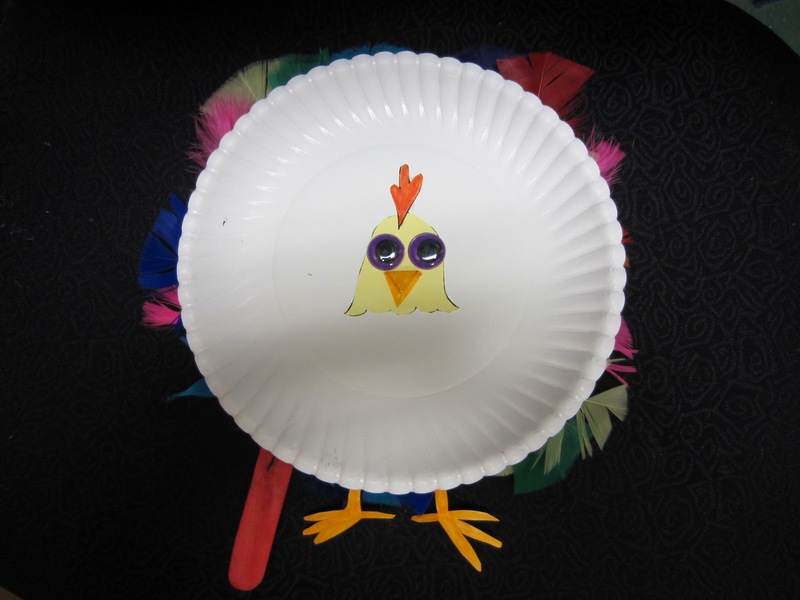 I just couldn't think of a very clever, catch-your-eye title for paper plate crafts. Believe it or not, I can make almost anything out of a paper plate. A snake, a rainbow, a frog, a chicken, the list goes on. All you need is a paper plate and a few other staple craft supplies, and your possibilities are endless. 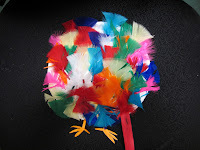 My staples include pipe cleaners, tissue paper, popsicle sticks, feathers, googly eyes, and card stock. You can get most of that stuff at the dollar store. Just google "paper plate crafts" and you can find a ton of ideas online. Or come in and see me and ask me for some patterns. I'm very proud of my creations! 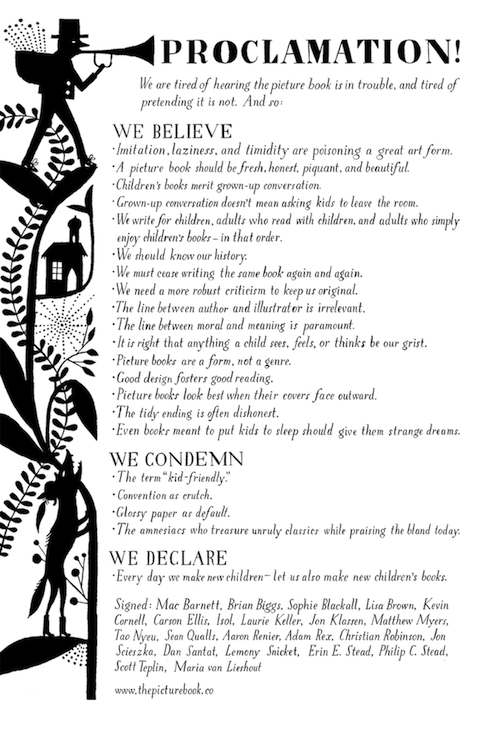 Several picture book authors and illustrators got together recently and signed this proclamation, penned by Mac Barnett and illustrated by Carson Ellis. It's a refreshing take on what writers and illustrators need to do to produce interesting, beautiful and relevant books for children in a time when publishing is changing fast. This is a good reminder that "Children's books merit grown-up conversation," and "Grown-up conversation does not mean asking kids to leave the room." "Every day we make new children-- Let us also make new children's books." Click through for a more legible version, and check out the fresh and lovely books of some of the authors listed at the bottom of the page. 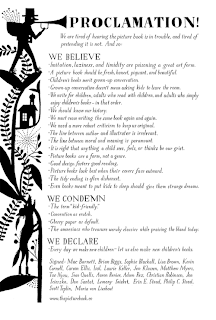 Thank you to Carson Ellis for bringing attention to the Proclamation through her blog.